This division has the responsibility to manage projects with outside agencies or consultants involving the use of GIS and to provide geography to selected features. Disclaimer: The imagery shown is representative only and does not have survey or engineering accuracy. Every effort has been made to make available the most accurate and current assessment data possible. The Terrebonne Parish Assessor's office makes no warranties, express or implied, regarding the completeness, reliability or suitability of the site data and assumes no liability associated with the use or misuse of said data. The Assessor retains the right to make changes and update data on this site at anytime and without notification. If you believe any of the data presented is incorrect, please contact the Assessor's office at (985) 876-6620. 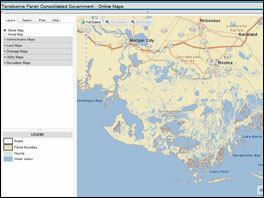 Click here to find proposed zone and base flood elevations. Enter an address in the Find an Address space at the top of the page to quickly identify the proposed base flood elevation for a property. The LSU Ag Center site provides estimations based on LIDAR and address information. Terrebonne Parish residents should contact Lisa Ledet with Planning and Zoning at 985-873-6565 if an official determination is needed.